Toyota started things off with a bang at the North American International Auto Show in Detroit by debuting its FT-1 sport car concept. Celebrating the 40th anniversary of its Calty design studio, FT-1 (which stands for the ultimate Future of Toyota apparently) continues a lineage that includes the 1978 Celica, Lexus SC400, Supra, FT-HS and LF-LC. In front of a large crowd of automotive media from around the globe, Toyota dignitaries introduced the future of Toyota sports cars with this two-door coupe that features new “function-sculpting” design language under a directive from Toyota boss Akio Toyoda of Waku-Doki, or, a palpable heart-pounding sense of excitement. FT-1 features a front engine, rear-wheel drive layout with the cockpit moved back to achieve optimum balance along with creating classic sports car proportions with the wraparound windshield and side glass openings a nod to Toyota’s heritage and the 2000GT. 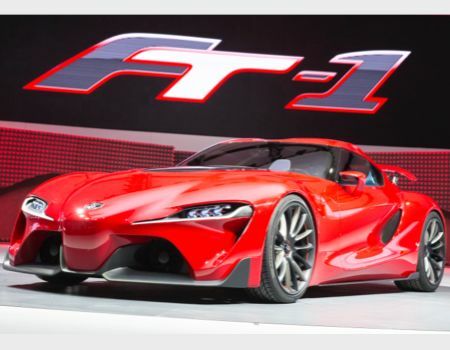 The car will feature a transparent glass hood but what engine it will reveal remains a mystery and no word on if or when FT-1 will make its way into a production unit.